The Institute for Healthcare Improvement (IHI) and Child Health Corporation of America (CHCA) have led initiatives to reduce the number of cardiopulmonary arrests occurring during hospital stays outside of the intensive care units (ICUs) by introducing the use of Rapid Response Teams. A cardiopulmonary arrest means that the heart has abnormally slowed or abruptly stopped beating, or the patient has stopped breathing. Medical research shows that before an arrest the patient may show observable signs of deterioration. Patient outcomes may significantly improve with early intervention. When bedside nursing staff and other clinicians are helped to do early identification, communication, and treatment of deteriorating patients—cardiopulmonary arrests may be prevented, and transfers to intensive care avoided. More than a decade before the IHI called for the creation of these teams, Children’s pioneered efforts to set up a rapid response team for preventing cardiopulmonary arrests outside of the ICU. Our process continues to be effective in preventing arrests. Recently many hospitals have followed suit. As a hospital whose mission is to take care of the sickest children in the community, we know complications may arise in the course of treatment. Having the correct processes in place assures an expedient clinical response when a patient’s condition starts to worsen. At UCSF Benioff Children's Hospital Oakland, a highly specialized multidisciplinary team of critical care physicians, nurses, respiratory therapists, and pharmacists is available around the clock to respond to cardiopulmonary arrests. Should a patient show signs of deterioration, the team is ready. To make our patients as safe as possible, we review every team response to ensure systems are working. We count and report the number of cardiopulmonary arrests outside of the ICU every three months, as well as the number of times the Rapid Response Team, is called. We determine rates by comparing the number of arrests outside of the ICU to the total number of inpatient days during the same time period. For the past two years, the rate of arrests outside of the ICU at our Hospital has been lower than the average rate seen in other children’s hospitals across the nation. *From the Children’s Hospital Association (CHA) pediatric database.The CHA Whole System Measures (WSM) hospitals are 34 of the largest and most advanced Children’s hospitals in America and constitute the most demanding standards of pediatric service in America. 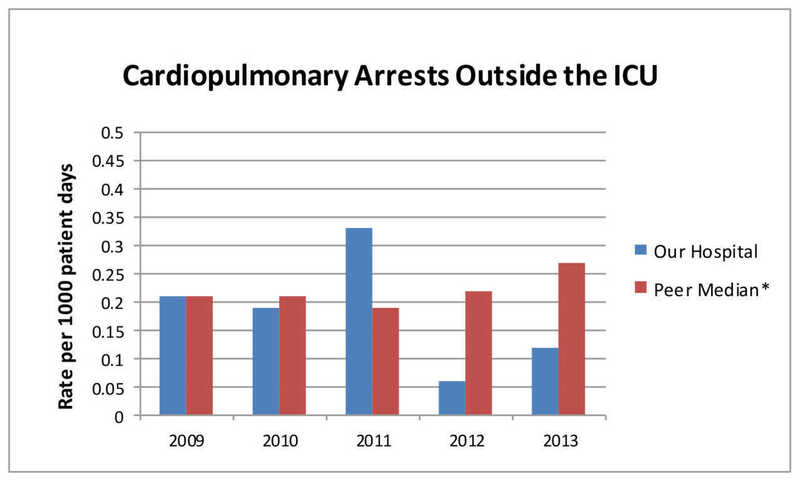 Our goal is to have zero cardiopulmonary arrests outside of the ICU. The number of arrests is very low, but we review each incident for ways to improve our systems. This is an ongoing effort.